Although the constitutional convention did not grant them equal suffrage, Montana women did retain the right to vote in school elections (first ceded to them by the 1887 territorial legislature). The new constitution also granted all tax-paying women the right to vote on questions concerning taxpayers. For Montana feminists, however, the goal was equality in voting rights. It proved a difficult target. Suffrage clubs formed and disbanded as the movement lurched between periods of concentrated effort and years of “discouragement and apathy.” The state legislature voted on equal suffrage during almost every session between 1895 and 1911. Suffrage questions sometimes passed in the House, but never by the required two-thirds—and never in the Senate. Without the two-thirds majority in both houses, the question could not be put to a simple vote of the people. After the 1911 session, however, a sophisticated and multifaceted organizing campaign changed the momentum. The first step toward victory came when suffrage advocates convinced both the Democratic and Republican parties to write equal suffrage into their platforms. Then, in January 1913, the legislature passed a women’s suffrage bill by large majorities (26 to 2 in the Senate and 74 to 2 in the House). This left the 1914 popular vote as the last hurdle to amending the state constitution. The campaign found arguments for every interest group, bringing in outside talent as necessary. New York laundry worker Margaret Hinchey proved particularly popular. The plainspoken Irish immigrant undoubtedly converted at least some of Montana’s class-conscious miners and loggers with her fiery speeches advocating equal suffrage as a tool for advancing the cause of workingwomen. 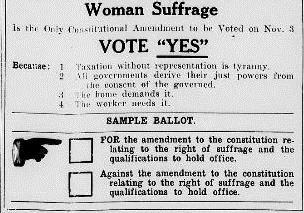 From its headquarters in Butte, the Montana Equal Suffrage Association (MESA) “mailed letters to women’s clubs, labor unions, granges, and other farm organizations, asking for pro-suffrage resolutions.” During the state fair, MESA published a daily paper, underlining its dual argument for suffrage. The first was simple justice: “those who must obey the laws should have a voice in making them.” The second asserted that women’s ingrained morality would reduce political corruption and make it easier to pass humane legislation. Women voters as a moral force was the prime argument of the state’s oldest suffrage organization, the Women’s Christian Temperance Union (WCTU). The WCTU had over fifteen hundred members and fifty chapters in Montana and ran its own campaign. State president Mary Alderson Long, of Bozeman, traveled forty-five hundred miles and effectively mobilized her members to engage in neighbor-to-neighbor campaigns. 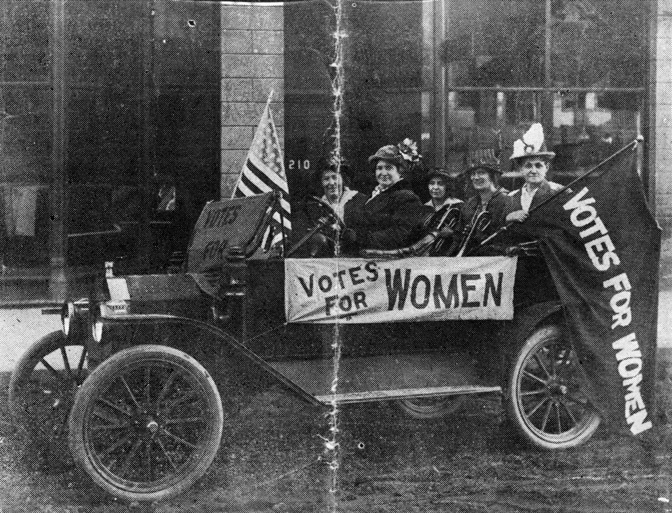 Nevertheless, MESA did not allow WCTU members a float in its grand suffrage parade for fear of tarring the suffrage movement with the temperance brush. The campaign emerged victorious despite such disagreements on tactics and the inevitable interpersonal rivalries. Ravalli County voted 70 percent in favor of equal voting rights, Missoula County 64 percent, and Yellowstone County 57 percent. The suffragists squeaked out a narrow victory in Hill County, but lost Silver Bow (home to Butte) by a mere thirty-four votes. In general, farming counties supported suffrage, while mining counties opposed it—possibly out of fear that women would vote in Prohibition. Want to learn more about the suffrage campaign? Visit our Suffrage page. Montana women used the momentum of their success to expand their influence into new areas of influence. Read “After Suffrage: Women Politicians at the Montana Capitol” to learn more. Suffrage Daily News (Helena and Butte), September 24-26, 1914, and November 2, 1914. Accessed December 17, 2013.